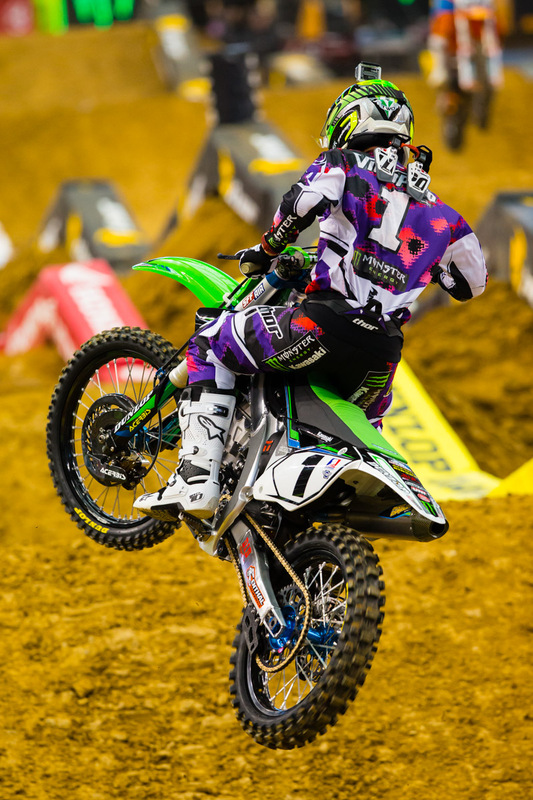 ARLINGTON, Texas (February 16, 2013) – The seventh race of Monster Energy AMA Supercross, an FIM World Championship, signified the 2013 season’s move east with 54,036 fans in attendance inside Cowboys Stadium. 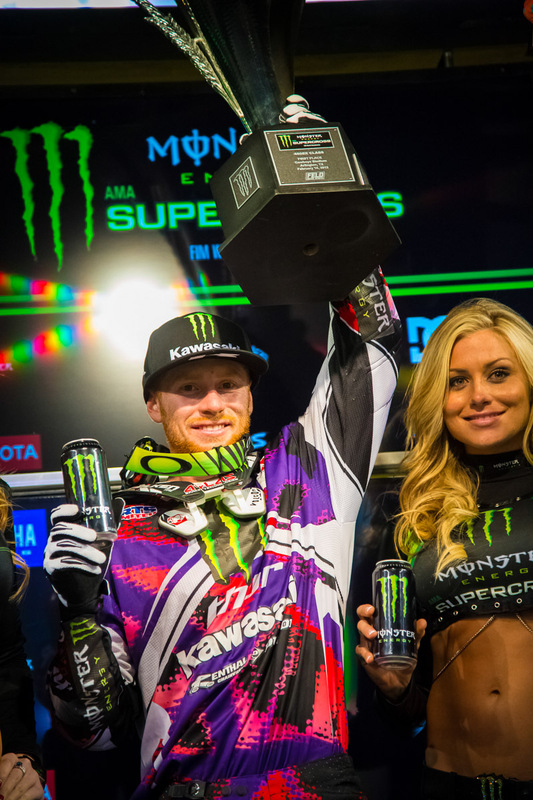 For the third time this season, reigning back-to-back champion Ryan Villopoto posted a dominant effort en route to victory aboard his Monster Energy Kawasaki, leading every lap of the Main Event. Monster Energy/Pro Circuit/Kawasaki’s Dean Wilson won the opening race of the Eastern Regional 250SX Class Championship, which will be in action for the next eight stops. Championship leader Davi Millsaps edged out Villopoto to claim the Nuclear Cowboyz® Holeshot Award at the start of the 450SX Class Main Event, but a little more momentum helped Villopoto slip past his Rockstar Energy Racing-mounted rival just a few feet later. Not long after, TwoTwo Motorsports Honda’s Chad Reed made an aggressive move to steal second from Millsaps, which allowed Villopoto to open an early gap. 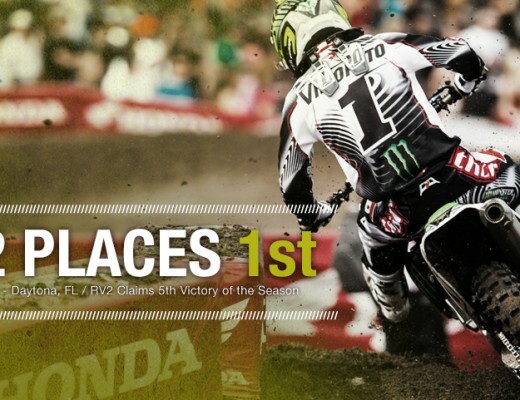 While Villopoto continued to pull away, the battle for the podium intensified. Millsaps reclaimed second place on Lap 3 and settled into the position. Reed appeared to have a secure hold on third, but Red Bull KTM’s Ryan Dungey began to apply pressure, ultimately making slight contact with Reed after an aggressive pass for the position on Lap 14. Dungey pushed hard in the closing laps to have a chance at stealing second from Millsaps, but couldn’t get alongside his championship rival in the end. Villopoto moved into sole possession of third in the championship point standings with his 27th career 450SX Class victory. Millsaps’ runner-up finish was his sixth podium in seven races this season, while Dungey extended his podium streak to four with his third-place result. Millsaps moved to 21 points ahead of Dungey in the standings, with Villopoto now sitting 24 points behind in third. After winning his Heat Race earlier in the evening, Team Yoshimura Suzuki’s James Stewart was unable to start the Main Event, citing a broken clutch. He dropped to ninth in the championship. A lot of excitement surrounded the first Eastern Regional 250SX Class Main Event of the season and out of the gate it was AG Motorsports Honda’s Kyle Peters who grabbed the Nuclear Cowboyz Holeshot Award. Behind him, Wilson and Rockstar Energy Racing’s Blake Wharton assumed second and third place. 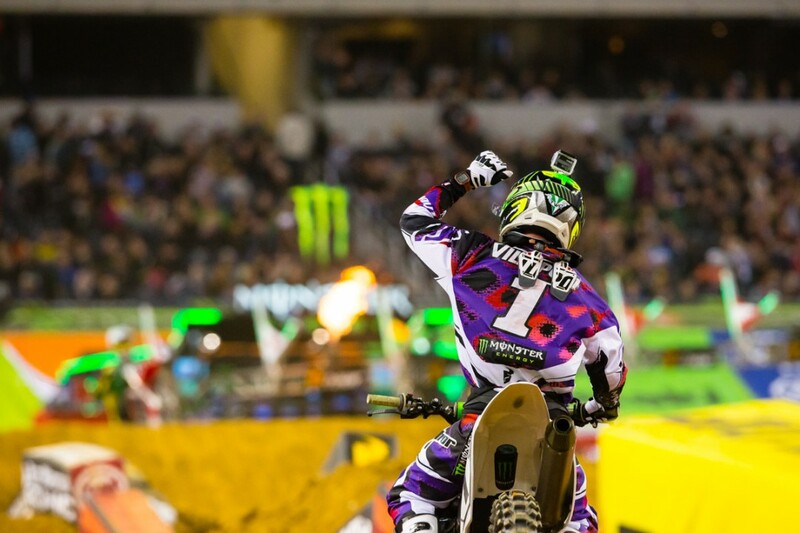 Wilson worked his way past Peters prior to the conclusion of the opening lap and then pulled away from the field to lead all 15 laps of the Main Event and claim his sixth career 250SX Class victory. Wharton made a pass on Peters shortly after Wilson took over the lead and secured the runner-up position throughout the remainder of the Main Event. Earlier in the evening, Wharton needed a win in the LCQ in order to secure his spot in the Main Event. Peters battled to hold on to third place, but was passed by Honda rider Cole Thompson on Lap 6. After Thompson crashed out of the race, Peters reclaimed the spot, but succumbed to the pressure from GEICO Honda’s Wil Hahn on Lap 10. Hahn maintained the position to round out the podium. Wilson will carry a three-point lead into the second race of the championship next weekend. Matt LeBlanc took the win in tonight’s KTM Junior Supercross Challenge, which was in action for the second time this season with 15 riders from around the region invited to compete. Monster Energy Supercross continues next weekend, from Atlanta with its annual visit to the Georgia Dome. The eighth race of the 2013 season begins next Saturday, February 23, at 7 p.m. ET. SPEED will provide live coverage of the race at 7:30 p.m. ET. Supercross LIVE!® is back in 2013 with a three-hour mid-raceday program from 2:00 – 5:00 p.m. local time. Hosts, Jim Holley, a former World Supercross Champion, and Kevin Barnett, a former member of the U.S. Men’s Olympic Volleyball Team and professional broadcaster, will provide in-depth analysis of the afternoon’s practice and qualifying sessions as the riders and teams prepare for the night racing, in addition to interviews and behind-the-scenes coverage. As the only place to follow live practice and qualifying coverage from Monster Energy Supercross, Supercross LIVE! provides fans with an inside perspective before the gate drops on the night’s qualifying and Main Events. Additionally, there will be video snippets made available throughout the race day that can be viewed on www.SupercrossOnline.com, the official website of Monster Energy Supercross, or the YouTube Channel www.YouTube.com/SupercrossLive. To access the live streaming broadcasts, go to www.SupercrossOnline.com/SupercrossLive or subscribe to the Supercross LIVE! streaming channel at http://new.LiveStream.com/Supercrosslive. For more information on the Monster Energy AMA Supercross, an FIM World Championship, please log on to www.SupercrossOnline.com, the official website of Monster Energy Supercross. To follow Monster Energy Supercross on Facebook, Twitter and Instagram, log on to www.facebook.com/supercrossLive www.Twitter.com/supercrosslive and www.instagram.com/SupercrossLive.com. Subscribe to our YouTube Channel at www.youtube.com.SupercrossLive. For all media requests, please contact Denny Hartwig dhartwig@feldinc.com or 630-566-6305. Feld Motor Sports, Inc. is the world leader in specialized arena and stadium-based motor sports entertainment. Feld Motor Sports productions include Advance Auto Parts Monster Jam®, Monster Energy Supercross, AMSOIL Arenacross and Nuclear Cowboyz®. Feld Motor Sports is a division of Feld Entertainment, the world’s largest producer of live family entertainment. For more information on Feld Entertainment, visit www.feldentertainment.com. 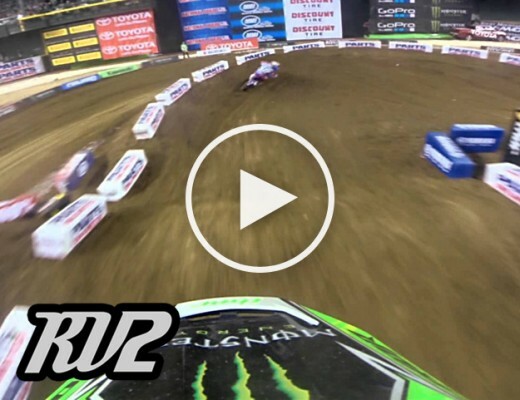 GoPro Main Event Video from Phoenix.